We haven’t quite left home, but that doesn’t mean I can’t start my beer journey. So for lunch, I took the opportunity to crack open a bottle of The Gift -Winter Bock Lager from Starr Hill Brewery. I love this beer for two reasons. 1) It’s the last of the truly “local beers” in that it’s brewed in Virginia. 2) Other than sneaking in a Bell’s Christmas Ale, it’s been my holiday beer of choice for 2009. A German-style Hellerbock with a few twists, The Gift is Starr Hill’s holiday offering. The beautiful golden color only hints at the fire inside. Made with two-row and Munich malts and balanced with German noble hops, The Gift is the perfect accompaniment to any holiday event or festivity. Either way, it’s been a perfect compliment through the holidays as I’ve been cooking, cleaning and spending time with family. So it seemed a fitting way to start this journey. Next stop, Maryland where we stay before flying out of Baltimore tomorrow morning. I’m heading out today for a family trip which will take me through at least 4 states with a final destination in Colorado. So what does any good beer drinker do? Look at travels as an opportunity to sample local beer. Keep an eye out for some upcoming posts about where we have ended up and what beer I’m sampling. Since my wife is from Pittsburgh it’s easy to pick a beer for her to drink while we watch the games (Iron City, of course. And yes, I do not let her sit on the couch if she’s going to root for the Pens). But what beer should I have in my hand to symbolize our local team? Old Dominion? Nope. Brewed in Delaware. I could run to a local Brew Pub like Capitol City Brewing but it would be really nice to have a bottled beer available in my local stores to sip and savor while watching my local teams. My wife loves me. Really. How do I know that? For Christmas she got me my first home brewing kit. And since I’m a self-professed non-expert (just a fan) she kept it simple and got me the introductory kit from Mr. Beer. I’ve spent lots of years drinking beer and watching the occasional show on Discovery on brewing and such. But I’ve never actually STUDIED brewing. So I poured over the instructions and read them over and over trying to make sure I hadn’t missed a step. And then over the weekend I meticulously followed the steps and brewed my first batch of home beer. Of course, I have questions and here’s the realization. I’ve known there’s a community of beef aficionados and had heard of many people with home brewing as a hobby. But it’s fun to discover all the resources and help forums. So for those of you who want to make the leap from consumer to producer, take a deep breath, pull a mouse up to the Home Brewing Wiki and feel confident that you’ll be able to figure it out… at least I’m hoping I’ll be able to. It’s gotten cold here in Northern Virginia. 17 degrees when I walked the dog this morning. And the wind chill? Let’s just say BRRRRRRRRRRR……. So it was perfect night to come home and enjoy the butternut squash soup my darling wife had made for dinner. I opened the fridge and looked for a hearty winter brew to compliment it. And here’s where I have to take back my previous post. I had picked up some of Old Dominion’s Baltic Porter. Paired with some sourdough bread, savory soup and fresh sharp cheddar cheese it provided a smooth compliment to the meal and an even better after dinner beverage. Dark in color, smooth, chocolate-like flavor and a pleasant aftertaste. I have to agree with David over at Musings Over a Pint that this is a fine example of another good seasonal brew from Old Dominion – and I do hope they keep up the quality when they move to Delaware. I just wish that a beer named after my state was still going to be in this state. Every now and then I find it’s fun to attach a theme to my beer purchases. For example from one of my earlier posts you could infer a summer/winter seasonal theme. So I found myself examining the brews at Wegman’s a few weeks ago and looking for something that would catch my eye. And with thoughts of my 9 month old chesapeake bay retriever I was drawn to two 6-packs that prominently featured dogs in the name or artwork. Heck, there are worse themes to go with, especially considering on my favorite beers of late is Smuttynose’s Brown Dog Ale. 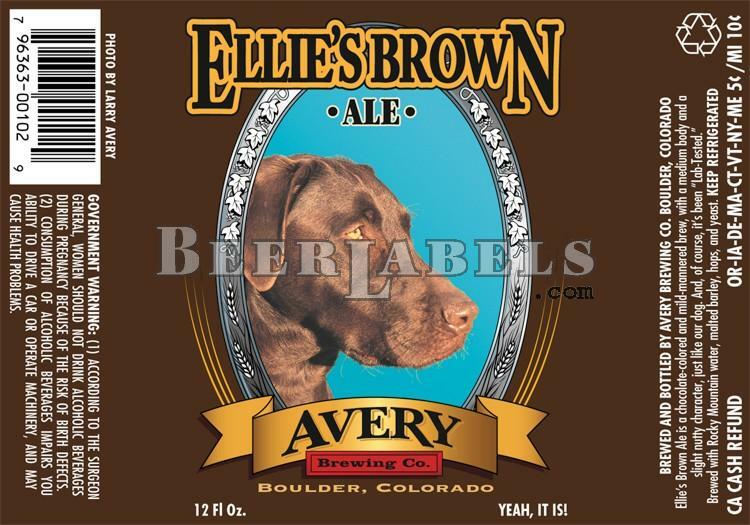 First up, is Ellie’s Brown Ale from Avery Brewing Company. Now it’s not just that the dog on the label looks exactly like my Chessie but I’ll definitely be heading back to pick u p more of this. Fresh from the Rocky Mountains, this dark ale features a nice chocolate taste that is more reminiscent of a porter than what you usually think of as a typical ale. Smooth and fulfilling as an after dinner drink it’s been the perfect brew to chill after a hard day’s work and enjoy. Now if one beer label looks like my Chessie, of course I also had to reach for the beer that reminded me of my 12 year old Black Lab – Black Dog Ale from Spanish Peaks Brewing. And just like my Lab, this beer was smooth and calming on the soul like that big dog head resting on my lap. There’s a very nice malty flavor to it that makes a pleasant and smooth drinking experience. So the lesson I learned was what? That beers that remind me of my dogs can’t go wrong? No, not quite. But it did point out that putting together a “beer theme” can be a fun way to pair up beers you may not have thought of before. Or at least it adds some joy to the shopping experience.